Maia Jaycox, the 2017 American Honey Queen, will visit Louisville, Kentucky August 17-23. She will make appearances at the Kentucky State Fair during her stay, speaking to fairgoers about importance of honey bees to the public’s daily lives and how the diverse flight path of honey bees extends from food to fiber. Maia will make appearances throughout the fairgrounds and will be present and the Kentucky State Beekeepers Association exhibit. Maia is a sophomore at Iowa State University in the open option program with an interest in biology. Maia began beekeeping with her family about four years ago and currently tends to seven hives of bees. 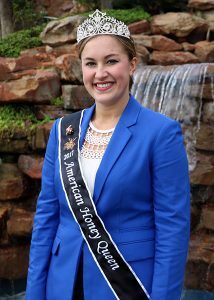 As the 2017 American Honey Queen, Maia serves as a national spokesperson on behalf of the American Beekeeping Federation, a trade organization representing beekeepers and honey producers throughout the United States. The Honey Queen and Princess speak and promote in venues nationwide, and, as such Queen Maia will travel throughout the United States in 2016. Prior to being selected as the American Honey Queen, Maia served as the 2016 Iowa Honey Queen. In this role, she promoted the honey industry at fairs, festivals, and farmers’ markets, via media interviews, and in schools. The beekeeping industry touches the lives of every individual in our country. In fact, honey bees are responsible for nearly one-third of our entire diet, in regards to the pollination services that they provide for a large majority of fruits, vegetables, nuts and legumes. This amounts to nearly $19 billion per year of direct value from honeybee pollination to United States agriculture. For more information on Queen Maia’s Kentucky visit and to schedule an interview, contact Tammy Horn Potter at 502-229-2950 or tammy.potter@ky.gov.